[UPDATE] A request for comment was made to the University of Pennsylvania, the University of Pennsylvania Law School and Marci Hamilton. We will update the post with any responses. [UPDATE 2] We have received a response via email from Ms. Hamilton and a letter was filed with the court at 10:59am. They have requested the address be updated accordingly. On January 9th, Judge Vazquez will hear oral argument on the motion for a preliminary injunction brought by plaintiffs in the Upper Saddle River action. In the coming days, I will share a few posts informing readers of the legal issues presented, what the parties are claiming in their briefs, and will answer questions regarding the status of the various cases. If you have any particular questions, leave them in the comments below. But right now, I want to highlight something in the papers submitted by Upper Saddle River — specifically, the return address for Marci Hamilton, Esq.Attorneys advocate for clients. That is their job. They should do it well and zealously. And while I never assume that an attorney personally adopts the arguments they advocate on behalf of their clients, they do get to choose which cases they take. Marci Hamilton took on the Upper Saddle River defendants as a client. But did the University of Pennsylvania? Yes, Marci Hamilton is an academic – but in a courtroom, lawyers are advocates, not neutral and objective parties. One final note. I do not mention anywhere on the brief that I am a law professor. It is a common enough practice, but one I am no longer comfortable with. The phrase “Affiliation noted for identification purposes only” doesn’t cure the problem. By telling a court you are a law professor–even if your institution does not support the case–you are still signaling a certain detachment from advocacy, that is simply not present. In front of a court, I am not a professor. I am an advocate. To that end, this brief advances arguments that the government does not. We Amicus plans to request leave to participate in oral argument in this matter. There’s no affiliation note on the brief. Perhaps, the University of Pennsylvania is an advocate against eruvs. Perhaps not. Using the University name or affiliation for pursuit of personal financial or political gain, or for the purpose of enhancing the prestige of an extramural activity. Curiously, as much as Ms. Hamilton is willing to indicate her employer on her motions and briefs, she does use her personal email address instead of her .edu one. 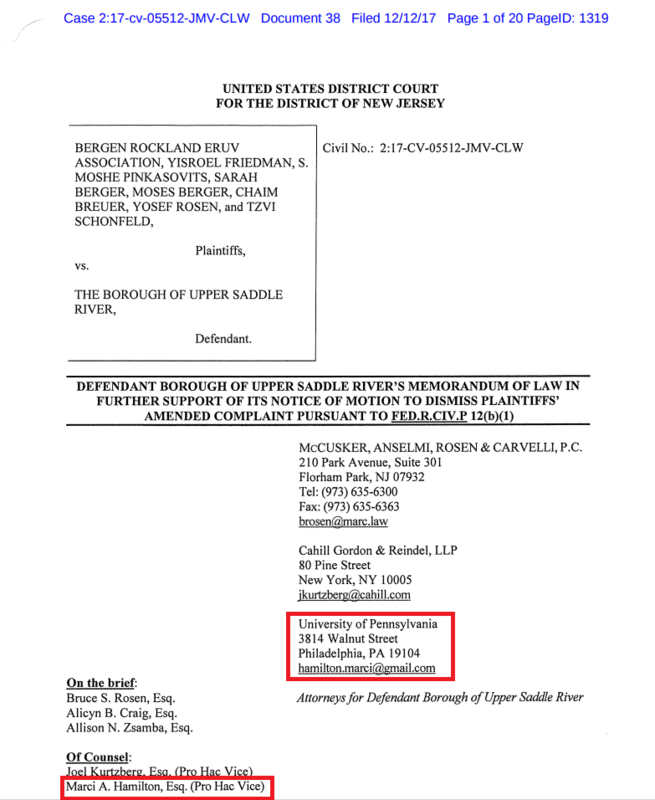 But, unless the University chose to be affiliated with the advocacy of Hamilton and Upper Saddle River in this action, use of their name to burnish her credentials with the court, as if she were merely a “detached advocate”, was improper. Stay tuned for information regarding the Preliminary Injunction motion and Motion to Dismiss, coming soon.